Hey guys, I fired the chevelle up this weekend since it was so nice out. It's been asleep all winter and today was the day. But I noticed somewhat of a popping coming from the drivers side exhaust. All my specs are in my signature. I only drove the car once after the roller cam swap in the Fall and maybe didn't notice the popping. What I did so far was pull the plugs. In the pic, from right to left is 1-3-5-7 and you can see #1 is far darker. I cleaned up the plugs, started and no change. Thinking #1 is the culprit for the popping, I then replaced the plug with a spare, no change. I made a new ignition wire and no change. I also took a vid and put my hand in front of the exhaust so it amplifys the popping. Towards the end of the vid you can really see the popping moves my hand. Any thoughts or next steps in diagnosing? Could my valve adjustments be off? I used the EOIC method..
Did you notice if one of the headers is colder than the rest? 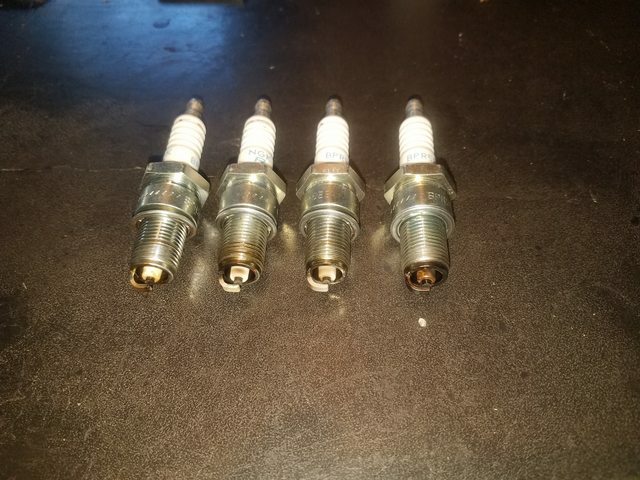 Maybe you should recheck the valves since you only drove it once awhile ago. Do you know anyone at a modern auto repair shop that could hook up a scope to it and take a look ? That would at least tell you if it is an ignition issue or something else. If it was running fine before you parked it then I doubt it has anything to do with valve adjustment. If it is a hydraulic roller you would have to be way off to make it pop. Unfortunately I broke my infrared temp gun. I just ordered a new one. I don't know anyone at a shop and I think around here, if they can't hook a scan tool up to it, they probably wouldn't know. It's a nice rainy dark day here in New England, maybe tonight i'll check for moisture in the cap or look for some arching? Gen IV 454 (out of C30 ), 390 heads 1.88/2.19 valves by Vortecpro, with ISKY Hyd Roller cam (at 050 218 int./228 exh, lift 530 int./552 exh. ), RPM performer intake, Fitech 600HP, Dougs headers, and M21, Gear Vendors OD, 3.73's, UMI Suspension, Viking coilovers. Not a bad idea. Where are you at in Boston ? Thats a ways up there. I consider Medford my second home Spent summers there till I was 19 and still visit a lot. My Mothers family is up there. I doubt this is an ign issue. More likely a mis-adjusted valve or valve sticking in the guide in #1 cyl. Any chance it is something in the injection ? I guess that is throttle body injection ? Does it clear up any if you raise the rpm ? a spray bottle with water on the exhaust after a cold start (or your bare fingers) will let you know if a cylinder isn't warming up as fast as the others. I didn't have enough time last night. All I was able to do was a cold compression test. And all the holes pumped up to 175-180. I pulled the valve cover too and the rockers were pretty loose. I can't imagine a valve being held open at all. 1 Attachment(s) Paris church on fire!